Soccer Hydration will in most cases separate the Winners from Losers on the soccer field, after the final whistle. 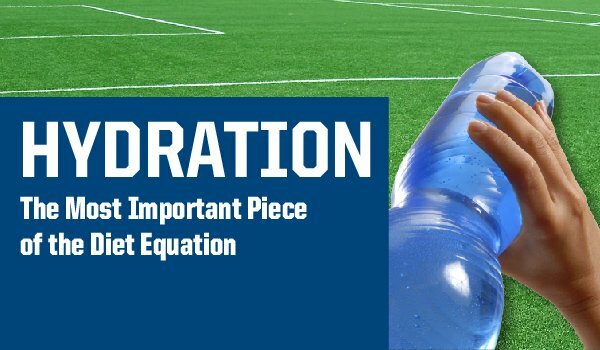 Proper hydration for soccer players focuses on the importance of drinking plenty of water for best performance on the field during games or practice. Our bodies will lose approximately 2-3 liters of fluid through sweat, during any competitive soccer match or high intensity practice. Another interesting fact about our body, is that we are made of approximately 65% of water that is constantly working on making our body healthy and performing daily activities. Next to oxygen, water is actually the most important nutritional part of surviving and the well being of an average person. Water is an even more crucial part of Nutrition for Athletes, or in this case soccer players. A person can survive for days, weeks or months without intake of other nutrients, however a person can only survive for a few days without water. Now that you have a better grasp on how important water intake is for our overall health, I will go more into depth for proper hydration for soccer players in particular. Because of constant running, change of speed and change of direction during a soccer match, our body regulates the body temperature by sweating. We sweat to cool off our body core temperature, and in turn we lose water in the excess of 2-3 liters during any competitive soccer game. Best way to figure out how much water our body looses after a game or practice is to simply weigh yourself before the game and than after the soccer game or training session. The weight lost after the game or practice will represent an average amount of water that we need to drink in order to keep our body hydrated, healthy and ready to perform. You can never drink too much water. If you feel thirsty, you are already dehydrated. Being thirsty does not work in the same way as being hungry. Sign of thirst is an indication that our body is already dehydrated and is asking us for more water. Everyone should drink about 75% of body weight in ounces daily. As an example, somebody who weights 100 lb, should consume 75 oz of water for proper soccer hydration. Consuming water should be a habit. Consume water all throughout the day to reach the daily fluid for the body to stay healthy and perform well under stress, such is playing a soccer game or training. People consume soda, lemonade, juices, sports drinks and other sugary drinks in belief that they will replace the water our body needs. Instead these sugary drinks only replace a small part (less than 50%) of water that we need to stay healthy. Proper water consumption should be practiced every day by creating a schedule to consume a glass of water or more every two hours throughout the day, especially for proper soccer hydration. Soccer hydration should consist of drinking 75% of body weight in ounces daily, and than soccer players should consume water in small quantities (20 oz bottle) before the game or practice and after the game or practice. Soccer hydration for players should include taking sips of water during the halftime or practice breaks. Stepping onto a scale before the game, and than after the game will represent the amount of water that soccer players need to consume to bring their hydration back up to normal. For Example: If a player wights in at 150 lb before the game, and weights 148 lb after the game, that player should consume 2 lb (32 oz) of water on top of the daily 75% water intake to re-hydrate the body for the next day game or practice. Hydration for soccer players or a regular person looking to stay healthy and hydrated can be checked through urinating. 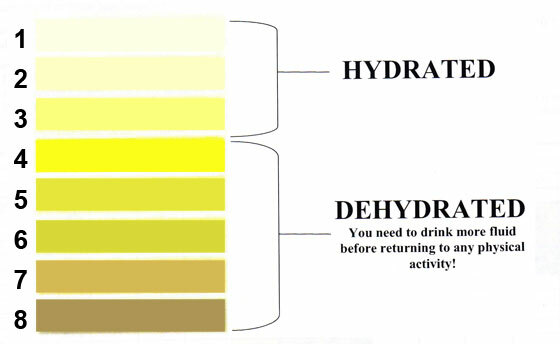 If the urine is white or barely yellow than the player is well hydrated. However, if the urine is dark yellow, the soccer player is already dehydrated and should consume water to hydrate their body ASAP. One good thing about consuming sports drinks, like Gatorade or Powerade, is that these drinks are made sweet for better taste, and they contain Carbohydrates, which helps with storing Glycogen in our liver and muscles for easy access to instant energy. Consuming sports drinks like Gatorade during practice or game is a good habit, but water should be our number one source for daily hydrating of soccer players. I hope you have a better understanding about the importance of water in our daily lives and especially soccer hydration for best performance on the field. For more information on Hydration and Water intake please visit 15 Hydration Facts for Athletes.